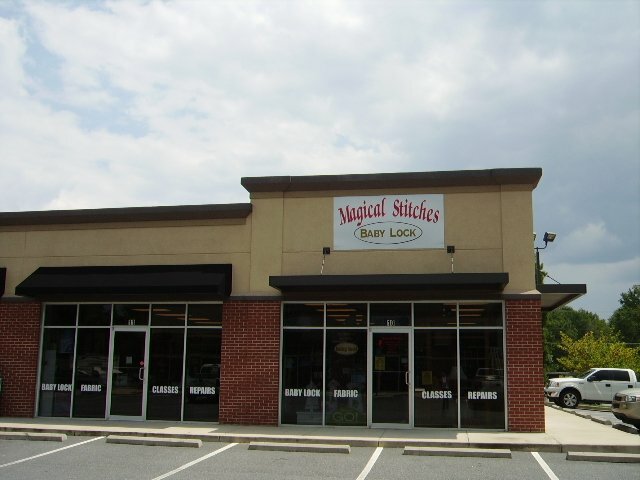 Magical Stitches, located in Macon, Georgia, is dedicated to providing sewing novices to more advanced sewists with a variety of high-quality products, along with exceptional customer service. We’ve got something for every sewist; fabrics, machines, sewing furniture, and custom quilting. We carry colorful, fun fabric lines. Some of our featured makers are Blank Textiles, Hoffman, Michael Miller, Bernatex, and Moda. We hope to inspire the artist within you by our fabric choices. We carry home sewing, embroidery, and quilting machines by Baby Lock. We offer machine mastery classes with every machine and software program we sell to help you get the most from your purchase. When you buy a sewing machine from Magical Stitches, you’ll be treated to a complimentary cleaning at the end of your first year of ownership. Come check out the Kaola Furniture we have for your sewing needs. For those of you who would rather have an expert quilt your quilt, so that you can move on to your next masterpiece, we offer in-house quilting services. No matter what your reason for dropping by, you’ll always receive a friendly smile and attentive service…because YOU are our number one priority. If we don't have what you are looking for, we’ll be happy to try to get it for you! As an authorized Baby Lock dealer, we carry the newest home sewing, serging, embroidery, and quilting machines. The Crown Jewel, Baby Lock's longarm quilting machine is a machine to see! You will always be able to rely on us for expert advice and friendly guidance throughout the ownership of your machine. Our customer relationships don’t end after machine purchases! Machines are cleaned and repaired in-house, with minimal downtime. Latest fabric lines arrive on a regular basis. Our prices are competitive. We offer layaway. Our in-house longarm quilting service is a treat for those who choose to have someone else do the quilting. Receive 10% off your purchases with proof of membership in a quilt or sewing guild (does not include sale or clearance items, QuiltCut2, Koala furniture or Baby Lock machines).